I’ve been on a quest to minimize the gear I need to carry to charge/sync my electronics. My current cable/connector bag is 10.5″ X 4.5″ X 3.5″ and weighs 1.75 pounds. It’s stuffed with cables I almost never use, so it’s hard to find the one or two cables I do use. I certainly don’t need to carry all that in my laptop bag every time I leave the house. To lighten my load, I’ve already found a couple of cable sets that weigh an ounce or less and take up almost no room in my bag. With the PlugBug Charger from Twelve South, I can even add a USB charger to my MacBook Pro power cord so I don’t even have to carry a separate USB power brick. Granted, all laptops have USB ports on them. Some laptops don’t have the higher-powered ports that are required for fast charging of tablets. Some of the ultrathin laptops have only one or maybe two USB ports, and you may need more than that for your portable gadgets. And sometimes you may just want to charge a device without automatically launching an app to sync it. The PlugBug gives your an extra 10W USB port without taking up an extra wall outlet when you add it to your MacBook power adapter. 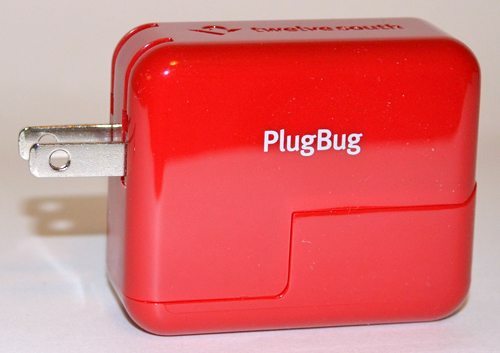 The PlugBug is made of shiny red plastic. It measures about 2.35″ long X 2″ tall X 1″ thick. It weighs 2.5 ounces on my digital kitchen scale. The electrical prongs stow away when not needed. The PlugBug can actually be used as a stand-alone USB charger. It delivers 10W of power, so it can quickly charge tablets, phones, and any other USB-chargeable device. Its bright red color will make it easy to find in the bottom of the darkest gear bag. Remove the bottom cover to expose a connector that replaces the power prongs (US style) on a MacBook power adapter. Twelve South says that the PlugBug works with current models of the MacBook Air and MacBook Pro, and it works with previous generations of MacBooks. With the PlugBug attached, the MacBook charger now has a built-in USB charger – two chargers using only one electrical plug. You can see that my MacBook charger is wider than the PlugBug, but its shape still allows the PlugBug to fit securely on the larger charger. 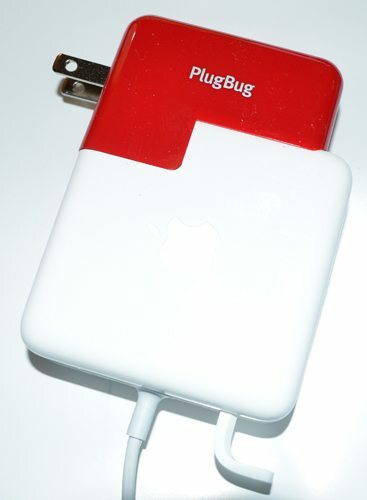 The PlugBug is securely attached to the MacBook charger. The charger takes up a lot of room on my power strip, as you can see here. It covers one more outlet than the MacBook Pro alone does. If your power strip had the outlets oriented sideways, the MB charger/PlugBug combination would take up no more room than the MB charger alone. When used as a standalone charger, the PlugBug worked to charge my iPad, iPhone, and my Sony PRS-T1 ebook reader. It worked equally well to charge those devices when attached to the MB charger. I didn’t notice any ill effects on charging my laptop while using the PlugBug on its charger. I gave the PlugBug to my husband, Butch, to use on a recent business trip. It took up almost no room in his bag, and it worked to charge everything. Butch can be a bit forgetful sometimes, and he said he liked having one less charger to keep up with in his hotel room. It was also convenient because he could charge up everything using only one outlet, instead of having to charge his devices at multiple outlets around the room. I like the PlugBug. It works well, and it takes up little room in your gear bag. I think it looks great when attached to the white MacBook power supply. You can use it as a stand-alone USB charger, even if you don’t have an Apple laptop.